Home > What Size Are You? We want to emphasize the importance of ordering the proper size so you get maximum personal benefits from the Wellness Belt. There are 6 holes in a Wellness Belt and they are sized to the 2nd outermost hole. Ideally, you should start out at the 1st or 2nd hole so you can become a lot thinner before the belt will need to be shortened. Wrap your belt around the waistband of your pants, but not through the belt loops on your clothing. A belt will normally go to its usual position - sitting in the soft tissue at the very top or uppermost part of your "hip bones", which are at the sides of your body. The hip bone we are referring to is where most people put their hands when they are standing with their hands on their hips, just below the waist. If you jam your thumb into your side you should feel the round top of this large bone. Undo the buckle and let the belt expand slightly - just enough to allow it to go down to about 1" or 2" below the tops of the hips. If the pin of the buckle does not go into a hole, then, while still holding it snug, make a mark on the belt with your pencil where it overlaps the tip of the buckle. If the pin went into a hole, mark or remember which hole it used. Now take the belt off and lay it on a flat surface. Take the measuring tape and measure from the hole the buckle pin went into (or the mark if you could not buckle up the belt) to the tip of the buckle, including the buckle in the measurement. 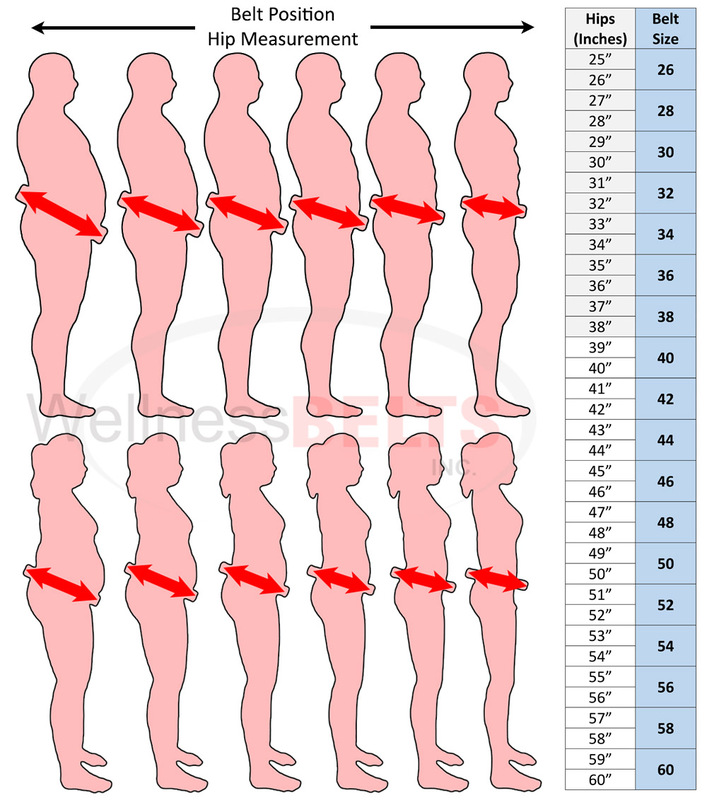 If your measurement is an even number; that is your Wellness Belt size. If you get an odd number you should go DOWN to the next even number - unless - you are already very thin and do not have any body fat on your hips - in which case you should go UP to the next even number. Shove your thumb into the side of your body and find the rounded top of your pelvis, (Iliac Crest) - the "elephant ear" bones we call our "hip bones"
Measure around your body an inch below your thumb.